Roger Soubie was born in 1898 and began his career as an artist after World War I. In the heyday of French poster art he was a contemporary of Roger Broders, Cassandre, and ALO. His work from this period is not as well known as the others, but upon examination his work stands up against the rest. Every artist has his own style and Soubie was no different. His art would be called traditional, beautiful colors and scenic landscapes highlighted his work. He never moved into the Art Deco style that Broders and Cassandre adopted in the 30’s. ALO is perhaps the one that he compares most to. The art of the poster is to capture the passing eye, beauty and color are often not enough. Your audience views your work as they rush through a train station or subway. To catch their eye, you need something special, and with Soubie it was the gift of whimsy that served him best. 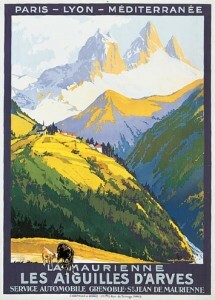 No better evident than his poster Les Aiguilles D’Arves for PLM. The scene is of famous peaks in the French Alps, the Needles of Arves, not unlike many similar posters for that part of the world. But Soubie succeeds in catching the viewer’s eye by having two cows in the foreground walking out of the image. Simple, but so effective. 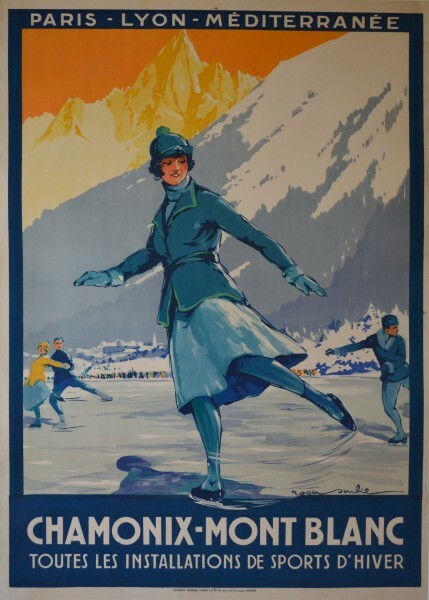 His poster for the 1924 Winter Olympics at Chamonix is equally eye catching. A beautiful girl skating, it catches the eye to this day. Roger Soubie had a second career, and to most of the world it’s the one he’s most famous for. Starting in 1930 and continuing for the rest of his life, Roger Soubie created movie posters of some of the world’s most famous films. Among his film posters are the French posters for Ben-Hur, The Birds and Forbidden Planet.